Just making videos without the thought of what you’re going to use to get the best results is a very bad idea. Making videos is so easy these days that it makes no sense for anyone to have bad quality videos. So let’s look at what you’ll need to get started. There are several ways to get started with video but the two most common are using your smartphone or a webcam. If you have a newer smartphone then you likely have a high quality video camera right in your hand. Today’s HD smartphone video cameras can produce some really nice quality videos if done properly. Videos from smartphones are being thrust into use by popular live video platforms such as Periscope, LiveStream, Live.me and particularly Facebook Live. The other popular choice for videos is a high quality webcam. Any decent laptop will have a camera included but these are typically lower quality and not very good for our purposes here. 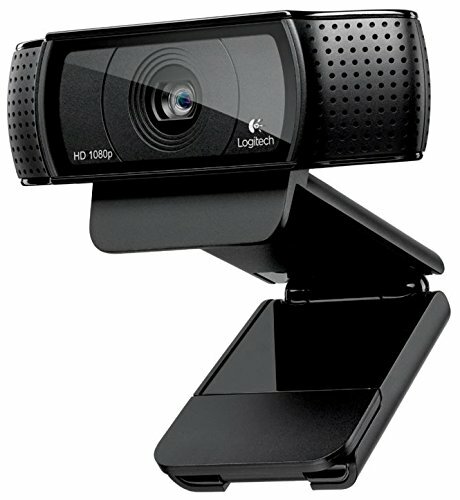 My webcam of choice (and the best value anywhere) is the Logitech C920. This full HD webcam can be purchased on Amazon for $60 and is well worth the investment. Although this camera has been around for some time, it is still available and widely used by video marketing pros. You can even mount the C920 onto a tripod for more versatility. audio quality will make someone stop watching your video within seconds. As with video, there are several ways to capture good audio. We’re only going to look at the most common and best starter options. I mentioned laptop video cameras earlier so it goes without saying that these same laptops have mics as well. As with camera quality, the mic quality isn’t great either. So, let’s look at a couple of other options here. If you’re using a smartphone, you can up your audio game by using a good set of earbuds with a mic built-in. The earbuds with built-in mic that come with iPhones and Samsung phones work ok for audio. Having the mic very near to your mouth makes a big difference. Even better is a lapel mic, also called a lav or lavaliere mic. These can range from a few dollars to hundreds of dollars. Not all lav mics will work with all phones so you’ll need to do a little research. One that I’ve found works well with iPhone and my Samsung (as well as other applications) is the Vidpro XM-L. This lav mic is actually for a camcorder but I’ve found it works well on other devices. In addition, the 20 foot cord makes it ideal for standing back away from the camera and still getting super audio quality. For my desktop setup I prefer a good USB mic. As with lav mics, desktop mics can run the gamut. One of the most popular and best value microphones I’ve found is the Audio-Technica ATR-2100USB. 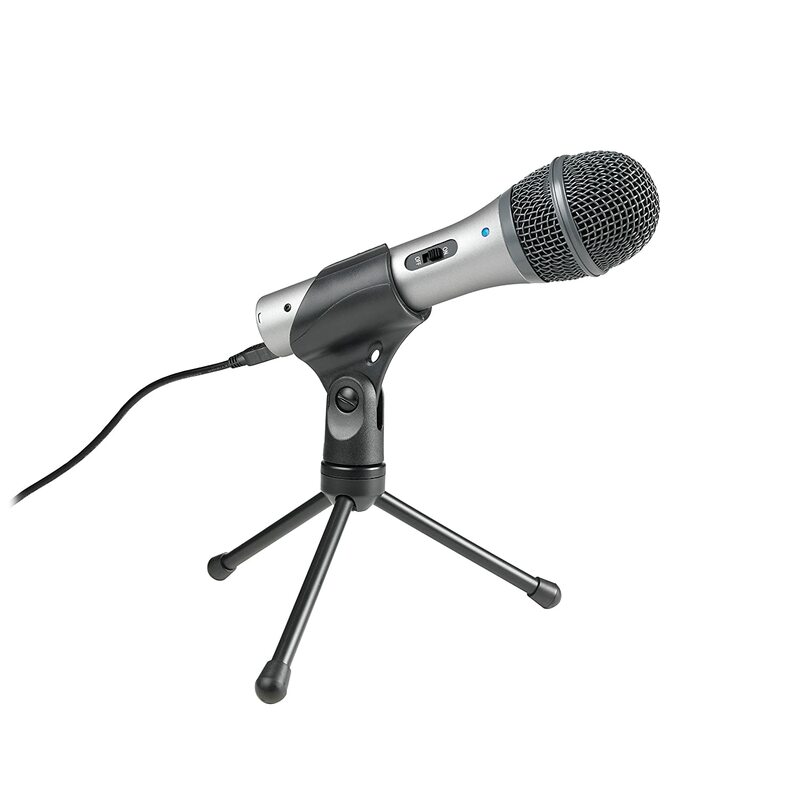 This mic can be had on Amazon for about $74 and plugs right into your computer or laptop. I also picked up a $15 mic stand so that I can sit or stand and still use this mic. I not only use it for videos but also for webinars, VoIP calls, virtual meetings and more. I always have the best audio in the room. Side story – Several months ago I was on a conference call with the CEO of a multi-million dollar company in LA. He could not get over how great my audio quality was. After letting him in on my secret, he bought these mics for every one of his call center employees. Now that we have your basic audio and video equipment sorted out, let’s discuss some other things that make a big impact. First, and the most important is lighting. Even the best camera will look like crap in poor lighting. Obviously, if you’re outside then you have plenty of natural light and you can use that to your advantage. There are things you can even do outside to make a difference, such as reflective discs and such if you choose. Since most of us are probably going to be doing inside videos, let’s focus on that. Whether you have good overhead lighting or not, paying a few dollars for some nice additional lighting will make a difference. Depending on how you plan to set up your recording area will determine your needs. The further you are away from the camera the more lighting and more powerful lighting you will need. You can pick up some nice studio lighting systems for under $200 if you plan to create distance from the camera or your indoor lighting isn’t good at all. 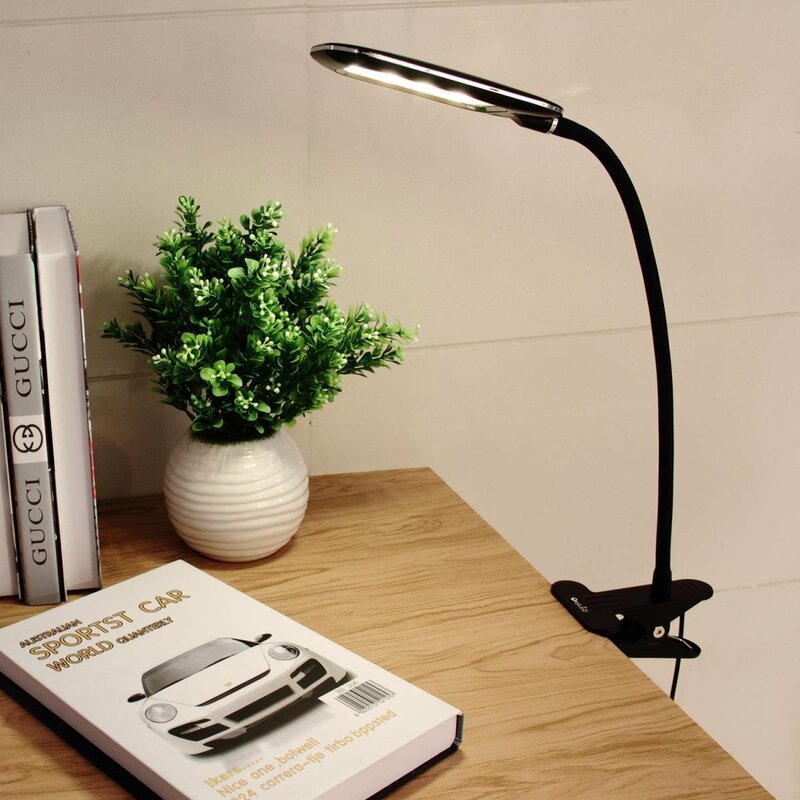 If you’re planning to do recordings at your desk and you have some decent overhead lights, you can pick up some clamp-on desk lights that will not take up your desktop real estate and still provide great lighting. Just a couple weeks ago I invested in some clamp-on lighting for my desk because I had some undesirable shadowing on my face that the overhead lights were creating. At $15 each, I bought 2 of these LED lights that clamp onto the back of my desk and are long enough to extend over my monitor to give perfect supplemental lighting. Even cooler, they are USB powered. If you plan to use a smartphone, invest in a selfie stick at the very least. There are also phone holders for putting your phone on a normal tripod. Just don’t hold it in your hand if you can avoid it unless the situation calls for it, like a man-on-the-street video. Again, the equipment you need will depend on your application. The last little piece of advice on equipment is your background. Now this doesn’t necessitate buying anything if you have a background that is pleasing and professional. But for goodness sake, don’t forget to consider what is in the background and what others are able to see. At my office, I have my office wall right behind me. There’s nothing special about the wall and there’s no room for me to have anything nice or interesting there. However, the wall is a medium brown color which I didn’t like. It made the video seem darker, wasn’t a warm color and even removed some personal detail since my hair is a similar color (except my gray “Mr. Fantastic” sides). I decided to invest in a white backdrop for about $11 and tack it up on the wall behind me. This one small change makes a big difference in my videos. People are use to seeing solid white backgrounds on many videos and tech commercials these days (think Apple commercials). Additionally, I don’t have to worry about viewers focusing on other things in the background. What about green screens? Green screens were all the rage a few years ago but it is usually easy to tell you’re using one and for most people it lends a depreciated level of authenticity; people prefer real. If you’re going live on something like Facebook Live then software for capturing and editing is not something you’ll need to worry about… or is it? Whether you’re doing live video or recorded video, having some basic editing abilities will help. If you’re doing a live video, maybe you want to take that live video, do a little editing and repurpose it for other things. The two most common software packages are Camtasia (PC & Mac) and Screenflow (Mac). Screenflow is included on a Mac but Camtasia will set you back about $200. If you can afford to invest in Camtasia, I would recommend it. Otherwise, spend some time learning some of these alternatives. Each one has its own pros and cons and can be used for different applications, even if you have Camtasia. It is very important to have a checklist of things before you go live or hit record. This can save you some time and frustration. However, one of the most important things you need to do in preparation is to have an outline of what you want to talk about. Start with the end goal in mind. What is it that you want the viewer to learn, do or walk away with after watching your video. From there, map it back to what you need to convey to the viewer to accomplish that goal. Go over your outline a few times and ensure you are familiar enough with it that you have an idea about what you want to say without having to read your outline or notes. There are some really cheap and even free ways to have a teleprompter available but this takes a ton of practice or you’ll come off very robotic and not prepared. Finally, where will you store these videos? The three most common platforms are YouTube, Vimeo and Wistia. As with most things, there are pros and cons to each of these. Do your homework and make an educated decision based on your needs. Personally, I use YouTube for some videos and a paid version of Vimeo for others. Ok, you have your outline, you’ve gone down your checklist, you have all the equipment ready, it’s time to have some fun. The great thing about recorded video versus live video is that you have the ability to start over as many times as you want. However, the worst thing about recorded video is also that you can start over as many times as you want. Look… you’re probably not going to like how you look on camera. You’re probably going to hate hearing your voice. Here’s a little secret… Your viewers don’t care. In fact, you will be your worst critic. Be careful that you don’t become your biggest obstacle as well. Don’t shoot for perfect, shoot for progress! Just get it done and get it out there. The more you do it the better you become at it. People love videos that are “real” and not highly polished. Just be yourself! You don’t have to edit out every mistake. Mistakes make you human and personable. If you have a sense of humor then let that shine through. If you are passionate about the topic, let it come out. It’s also ok to have edits that are quick cuts instead of fades or splices. You see this done all the time. It is considered a creative effect these days to edit in that style. Of course, if you’re going live you don’t have the option to edit so make sure you know what you want to say and stay on task. The better you know what you want to say the smoother the delivery will be and the less “ums” and “uhs” you’ll have. Be deliberate in your speaking and when you find yourself wanting to say “um” and “uh” just stop, take a short breath and keep talking. Having a short pause is not a bad thing. Speaking slowly helps to keep you calm and aids in allowing viewers to better understand what you’re saying. Stay away from meaningless, repeating phrases as well. This can drive people nuts. Ever watched a video and the presenter kept saying things like, “Know what I mean”, “Like I said” or “You know”; did it drive you crazy? Be conscious of your tone and inflection. You want to speak with variety and emotion and stay away from monotoned and boring. Make sure your camera angle is either straight on, eye level or slightly higher. No one wants to look up your nose or feel like they are watching a first person video of you sitting on their chest. The biggest question I get asked about recording video or podcasting is, “How long should my recording be?”. The answer is simple… it needs to be as long as it needs to be to accomplish your goal. If your topic is engaging and the content is valuable, people will watch or listen much longer. Let the content determine the length. However, there is evidence that a sweet spot exists for holding someone’s attention at the highest level. I always recommend keeping videos to 3 to 5 minutes, depending on the application and goal. If you have content that will take 20 minutes, consider breaking it up into smaller videos if possible. That may not always be possible but it also may not always make sense. For example, if you’re doing an interview or webinar, you may not want to chop it up into smaller pieces. But if you’re doing tutorials, you’ll want to keep it short and to the point. My last tip here is to remember to always watch your videos; if live then watch the replay. You will pick up on things you will want to do differently or improve on. Always review your work. Now that we’ve covered equipment, software, tips and tricks to get you well on your way to being a video pro, let’s look at how we can roll all of this together into actionable results. There are a ton of ways to use video but I’m going to focus on ways you, the IT professional (and probably business owner), can use video to take your business to the next level and blow your competition away. With just a few simple ideas from this article implemented correctly, you will be surprised at the results that they can bring for you. So, let’s get started. How many times do you have to show someone how to do the same thing you just showed someone else yesterday? Creating video tutorials is a great way to allow your customers to help themselves and it can free up your time to invest that in other ways. Even though you’re doing a screen recording, you may also be able to have a small frame in the corner to show off your mug. Alternatively, you could do a quick intro and outro video of yourself and put the screen capture in the middle. Anytime you can show yourself, you are building relationships with your viewers. Use video to communicate with your customers. Instead of just sending out a newsletter or doing a blog post, include a video version. People digest content in different ways. If you’re only putting out written content, you’re leaving out a huge audience that would prefer video. People love to get alerts about things that are important for them to know. With all the threats facing any Internet connected user, there shouldn’t be a lack of content for you to talk about. Use videos with tips and tricks on using Windows, Office, Chrome, etc. so that you educate your viewers and empower them with knowledge. Remember, just because it is common knowledge to you, that doesn’t mean it is for your customers. Using the free version of Zoom, you’ll have a great video conferencing tool with up to 40 minutes of recording. Use this for recording meetings, quarterly business reviews, IT project meetings, proposals, interviews, video testimonials, video case studies, customer presentations and even remote support. With Zoom, your customer can install the app on their phone and then share the screen with you so you can easily walk them through support for their smartphone. How would you like to see what your client sees… without Facetime or Skype? Use Zoom so your customer can show you what they’re seeing in the network closet or what the router and modem lights are doing. Even record the entire call so you can send the customer a video copy, put it with your support ticket or use it for in-house training. True story – Just last month I had a tech that had been battling with a client network issue for hours. The client is hundreds of miles away so an onsite visit wasn’t an option. I had the client install Zoom on her phone and walk me around the office and show me the equipment. We discovered another router that a medical vendor had installed on a monitored refrigeration unit. The router was setup incorrectly and was trying to hand out IP addresses, thereby conflicting with our main router. We would likely have wasted a lot more time before we figured this out without using video. Want to highlight that new tech gadget, promote a service or do a product unboxing? Video is the way to go. Use videos to promote your services. However, don’t highlight your services; instead show viewers the benefits of the service and how it can work for them. Use videos to do a company overview to show customers and potential customers about your business and staff. Create staff presentations or internal training videos to help train staff. Create annual reports or reviews to send to customers. Create your own commercials to post on your website or social media. Use video for content marketing. How about a weekly video show, like a “Thursday Tech Tip” or “5 Minute Fridays”. Be creative. Publishing content on a schedule will let viewers know when to expect your next awesome video. Create videos for landing pages or your website. Promote sales, promotions, events, etc. If you have events or promotions happening, be sure to record it and consider doing live video segments go get instant response. Place a video in your lobby, sales floor or other customer areas. A really neat thing to do is a “behind the scenes” video or “day in the life” video. People love to watch others live their life and go through their day. Use video in an email drip campaign building up to an event. We’ve already talked a bit about Zoom but did you know that you can also use it as a webinar platform? Invite your customers to participate and have live interaction with them. Want to try an even easier live webinar platform? Try Facebook Live or YouTube Live as a live webinar platform. Even embed it into your website for a custom experience. If you want to do recorded webinars, there are platforms for that as well. Alternatively, you can record your webinar, post it in a page on your website and send out an email to your customers to attend. As you can see, the case use for videos in your business is massive. If you are not currently using any form of video in your business, I challenge you to start today. Once you find yourself proficient in video you may even find that you are able to create a service around this niche for your customers. Trust me, people will pay you for this service. If you are currently using video, post below what you’re doing and how it is making a difference in your business. If you’re not using video, post below and tell me what is stopping you.